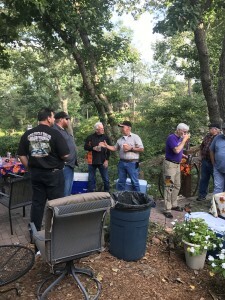 Another successful American Legion Riders party at Keith & Sandy’s house. 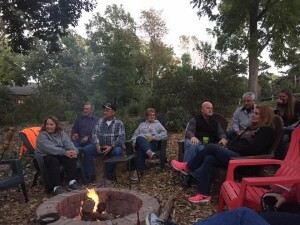 This is a get-together we all look forward to each year. Our riders aren’t just Legion members, we have become friends. Every year for the past 4 years, Keith & Sandy have hosted this annual BBQ at their home. It is always so much fun. The food was great, Ribs, Chicken and so many delicious sides. Of course there was a dessert table full of goodies. 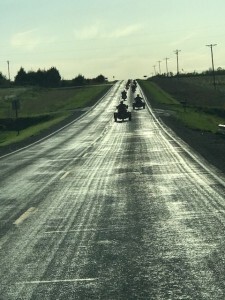 This is an annual ride the American Legion Riders take together. We take a ride down country roads and then stop in a small town. Our lunch is from a “brownbag”, or any type bag will work. 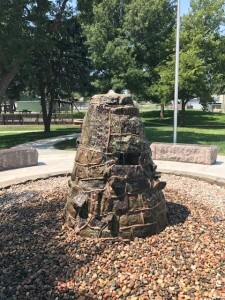 On July 2, 2017, the American Legion Riders had their annual July Fundraiser. This year our focus was on Raising Awareness of Veterans Suicide. 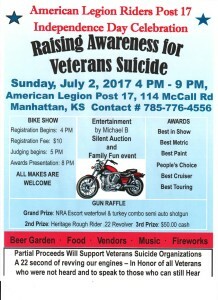 Part of the proceeds raised during this event will support a local veterans suicide organization. This year we had a Bike Show, Entertainment by Michael B, Silent auction, Gun Raffle, Fireworks, Vendors, Food and Beer Garden. Our monthly dinner ride for April was to an excellent restaurant in Clay Center. The food is great and the service is fast. We will start going on dinner rides now that the weather is getting warmer here at American Legion Post 17. Each month we pick a different place to ride, and grab a bite to eat. It is always a good time. For more information about joining the American Legion Riders group contact our post home. 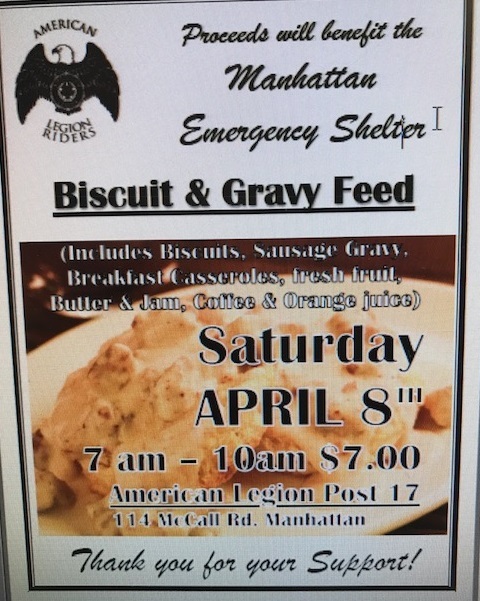 On April 8th the American Legion Riders put on a “Biscuit and Gravy Feed” from 7-10 am. The proceeds will benefit the Manhattan Emergency Shelter. We offered biscuits, gravy, breakfast casserole and fresh fruit. Plus coffee and juice. It started out a little slow but, when it got busy it stayed busy. All the riders were doing a great job keeping the food trays full. No one went home hungry that day. 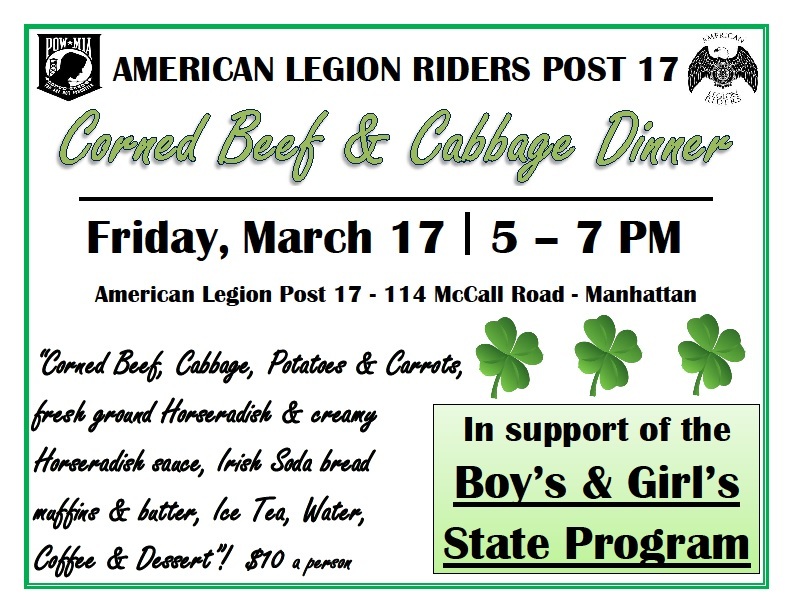 Another successful “Corned Beef and Cabbage Dinner” was put on by the American Legion Riders Post 17. Our group enjoys putting on fundraiser dinners. For this particular event there are only pictures of us preparing the food for this fundraiser. 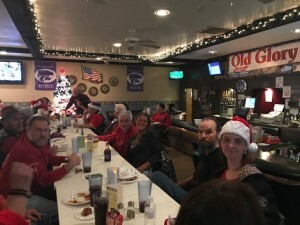 On December 13, 2016 the American Legion Riders had their “white elephant” holiday party. It was so much fun picking out a present and wondering if it would be taken by someone else. We had 26 members who participated in our holiday party. On November 26, 2016, the KSU Wildcats played against their biggest rival- KU Jayhawks. The American Legion Riders were lucky enough to get the opportunity to park cars for this game. I say lucky because this is a huge fundraiser for our group. It can take years to get your name drawn to participate in this type of fundraiser. This year was our lucky year!! 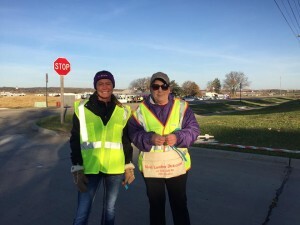 We don’t have pictures of everyone, but we had a good turnout of helpers. I believe it was 10 riders who helped out that day. 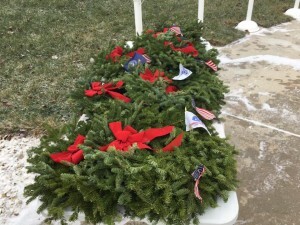 The ceremony for “Wreaths Across America” was on December 17, 2016 at the Kansas Veterans’ Cemetery at Fort Riley-Manhattan. The American Legion Riders always look forward to our end of the summer cookout at Keith and Sandy’s home. It’s a great time to get with our friends. There is always plenty of good food and drinks for everyone. We always end the night sitting around the fire pit eating smores and enjoying each others company.